this is my breakfast from the other morning. it made me laugh because of all my drinks. i've been trying to get rid of NINE POUNDS of bloating from my monthly stuff, so i've been drinking lots and lots of water and natural diuretics (i.e. cranberry juice & coffee). i've been mostly eating "watery" foods too. it's working. i'm 3 pounds down. 6 more liquid pounds to go! haha that breakfast looks really good to me. every morning i have coffee, kombucha tea, and sometimes a smoothie. i just love drinks! but that waffle does look really yummy too! I love the glass you have the cranberry juice in (if thats cranberry juice). 1,000 times more fun to drink, eh? mmm french press coffee. pretty and yummy! i've been going to bikram yoga for the past few weeks and i can really see a change in my body! you have to drink so much water during the day then you get to sweat it all out in class... you feel really great afterwards. way to go! you can do it. i love cranberry juice. am i weird? hahahaha wow! i now you had to use that bathroom!!! I am trying to drop a few pounds as well but mine are from too much eating and cooking in the first few months of my marriage. I tried to be a good wife and all that happened was I ballooned. So far three pounds down and I have another 13 to go. Yuck. Good luck with your liquid diet! You may already know this (I, however, just found out recently) stay away from salty foods. They make you bloat even more. yea I've been on a diet for a month now. I got back from recovering from my surgery and I found that none of my pants fit me anymore!! Since I had foot surgery I am not able to really work out yet so I decided to go on a food diet/healthy eating kick. It is totally working too. I started it a month ago and I got 10 pounds since and yesterday I put on a pair of jeans that didn't fit me at all a month ago. :D And they fit comfortably too. I always do that too...coke, water, and juice are my breakfast drinks! I need to try your cranberry cube trick...I'm really struggling with this whole water thing! ooh iheartkiwi, i've been dying to try bikram yoga! sounds so cleansing. i've been doing this same kind of diet lately (well, mostly just a LOT of water) for the same reason. it must be a summer thing but i've been bloaty mcbloaterson this month. overshare! 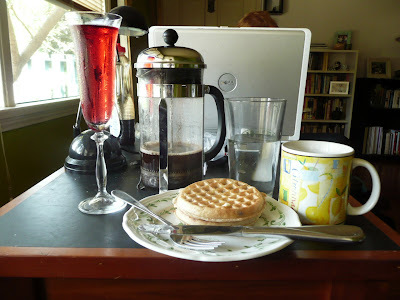 Much <3 <3 <3 for french press coffee. We're HUGE fans over here. haha! I'm the same i usually sit down to three drinks at breakfast time. you should try kombucha. I gain lots of water weight each month due to the same things... I've been trying to stay steady since my wedding is coming up and so I started drinking Kombucha. It is kinda pricey but really really helps with bloating! haha, too cute. You know what's really good? Lemonade with Frozen Peaches in it instead of ice. Yummm. And it's filling!